The Moto trail is located in the Lunch Loop Trail System near Grand Junction, Colorado. The upper end of the trail begins at the junction of the High Noon and Raven Ridge trails where it is best ridden in the downhill direction. The trail makes its descent down various ridges until it drops into the colorful purple and gray bentonite badlands below Raven Ridge. 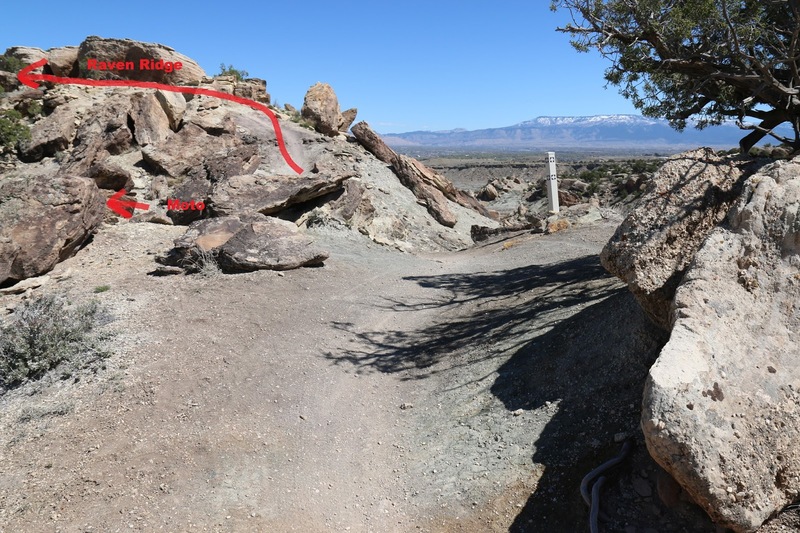 The trail can be cut short at a junction with the Tabeguache trail soon after it starts and near the 0.6 mile point or it can be continued for another 0.4 miles to a third junction with the Tabeguache trail near Bentonite Hill. This post begins at the Moto's junction with Raven Ridge. The Moto trail immediately begins descending from the saddle in the ridge down a moderately steep route. The trail briefly levels off and a short spur that runs over to the Tabeguache trail branches off on the left. As the downhill takes off again mountain bikers can watch out for a few optional jumps that come up. The next big drop is not only steeper but it also has some good bumps to either navigate over or around depending upon your liking. There is another built in jump as the trail straightens out that has a nice long runoff to it. The trail continues with a lot of downhill left that tends to get smoother as it goes. The lower end of the trail courses through a stretch of very scenic badlands that is almost totally devoid of vegetation yet abundant in beauty. There is an open area near Bentonite Hill that some riders use as a playground although there aren't any signs marking it as such. After passing below Bentonite Hill Moto meets up with the Tabeguache trail and comes to an end. From here the trailhead is less than a half mile away to the right and Pete-e-kes is just around the corner. There are so many options that it is nice to print a copy of the COPMOBA map and take along until you get used to the area. The GPS file that is linked to this post includes almost all of the Lunch Loop trails and routes for those that want to know exactly where they are in the area. For mountain bikers that like fast downhill with a few technical features or hikers looking for another option the Moto trail is well worth checking out. If you would like to see it for yourself then all you have to do is grab your bike or 'Take a hike'.